You may redirect 1 challenge this round. 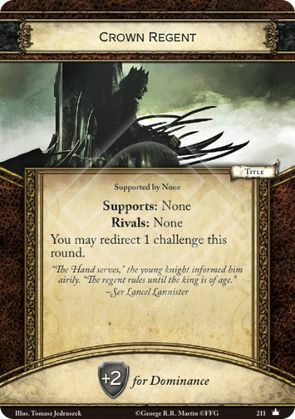 If a challenge is redirected, the player who is initiating the challenge must immediately choose a new opponent to resolve the challenge against. The attacking player may also choose new stealth targets (controlled by the new defending player) if he or she desires.